One of the Civil War's earliest battles, in October 1861, the Battle of Ball's Bluff involved relatively few soldiers, but it had significant results. The battle gave rise to hopes of success in the Confederacy, and it greatly reduced the Union's hopes for a quick end to the war. Before the battle, the Union had suffered defeat in the Battle of Manassas nearby. After that battle, troops from both sides were stationed along the Potomac. Southern soldiers protected Leesburg and Northern soldiers guarded Washington. The Potomac was the dividing line between North and South, but it was relatively quiet during the early days of the war. Union troops gathered along the Potomac in a show of force to drive away the Confederate troops. In one venture, a small group of Union soldiers crossed the Potomac on October 20, 1861, at Harrison Island, in an effort to find a Confederate camp. A nearby brigade of Confederate troops encountered the Union soldiers, and a brief skirmish ensued. Reinforcements from the North had trouble crossing the river to assist the Union soldiers. At the same time, additional Confederate troops arrived quickly and forced the Union into a semi-circle near the bluffs. The commanding officer of the Union, Col. Edward Baker, was killed and his troops were forced to retreat. Many Union soldiers jumped to safety from the bluff, and others died in the swift Potomac waters. More than 700 soldiers were missing in the hasty retreat. The tiny cemetery is the burial place of Union soldiers who fell in battle on the site. There are 25 graves in which the remains of 53 unknowns and one known (Grave 13) soldier are buried. A government memorial headstone to Col. Baker (buried in the San Francisco National Cemetery) is located on private property 66 feet south of Ball's Bluff. A private monument outside the wall of the cemetery but on government property marks the grave of Clinton Hatcher, Confederate soldier. 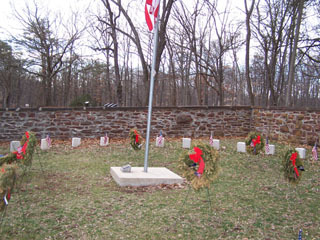 Surrounding the National Cemetery, Ball's Bluff Regional Park has hiking trails and picnic tables. Fishermen regularly make use of trails down to the river. Interpretive signs describe the Battle of Ball's Bluff and its role in the Civil War. The battle was the largest Civil War action in Loudoun County.